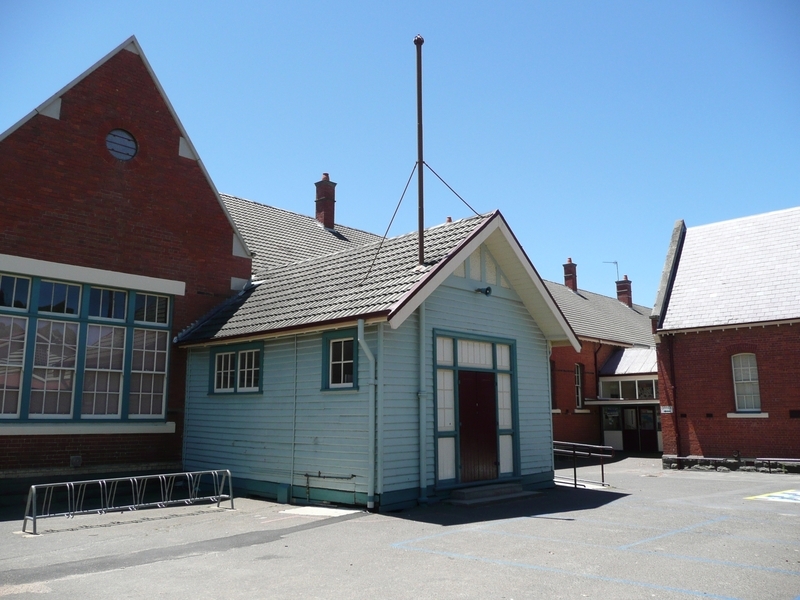 Ballarat, Dana Street Primary School No.33 was constructed in 1856 as the first National School in Ballarat West. 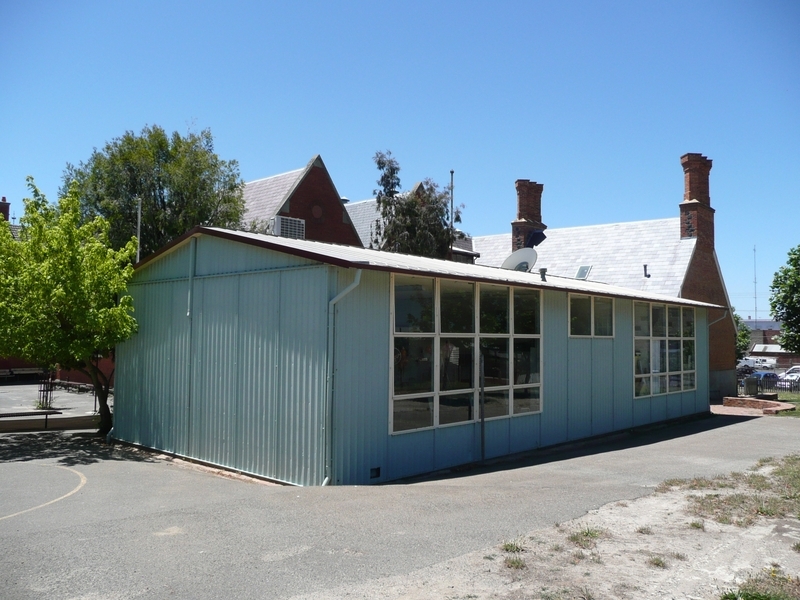 It was designed by the prominent Geelong architectural firm of Backhouse and Reynolds and consisted of a classroom and attached two storey residence. It was opened on 12 January 1857 and was conducted initially by Mr and Mrs Charles Martin. A second building was built in 1875-76 adjacent to the former National School to face Dana Street. 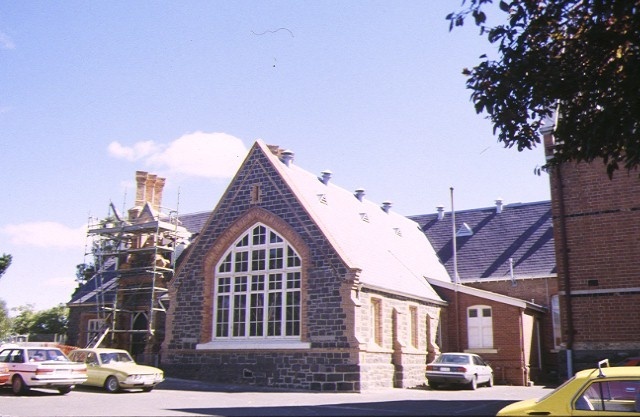 This Education Department School was built to a design derived from the Buninyong school of 1873-4. The 1856 building is of bluestone construction with with red brick detailing and a steeply pitched slate roof. The bellcote which was removed in 1948 was reinstated in 1998 along with the chimneys. The blank brick wall on the south side of the residence suggests that the original intention was to duplicate the northern wing to form a symmetrical composition. The 1876 building is constructed of redbrick and has an H-shaped plan with gable roofs. The site contains a timber shelter shed and a Bristol classroom. The Bristol classroom is a prefabricated aluminium building dating from after the Second World War and contains two classrooms with a central entry and store-room. Ballarat, Dana Street Primary School No.33 is of social, historical and architectural importance to the State of Victoria. 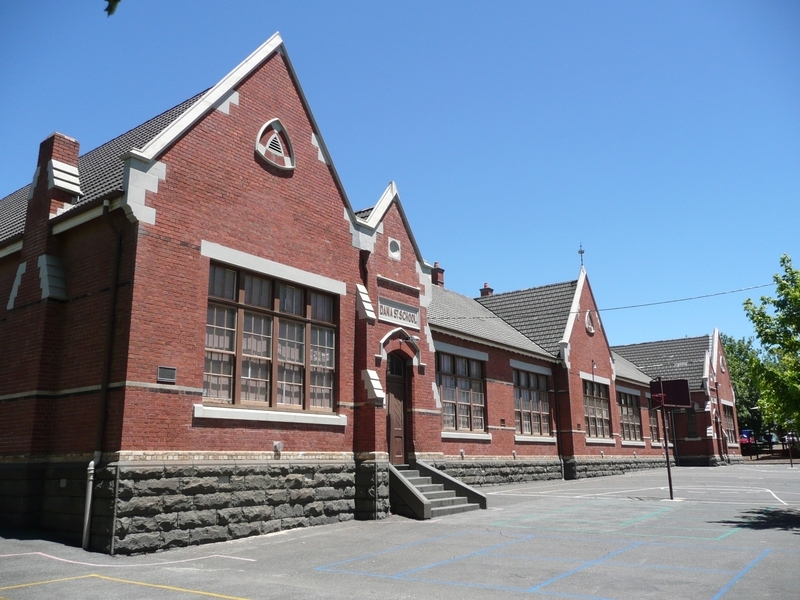 Ballarat, Dana Street Primary School No.33 is of social and historical importance as it is a school which has operated as a local school for 140 years and reflects the social and historical changes that have occurred in Ballarat since its beginnings as a National School in 1856. The establishment of a National School in 1856 represents a boom period in Ballarat , when there was a rush for gold in the area. The prefabricated Bristol classroom on the site is a representative example of a building type. It demonstrates the shortage of building materials in the years immediately after the Second World War . The use of imported prefabricated aluminium classrooms was a response to the pressure on the Education Department to provide for a rapid growth of population after the Second World War. Ballarat, Dana Street Primary School No.33 is of architectural importance as the 1856 school is an intact example of a National School. The residence which was part of the National School retains its original floor plan. The National School is an early example of the work of prominent Geelong architects Backhouse and Reynolds who formed in 1855. A detail of note is the use of brick dressings to the window and door reveals and in the buttressing which provides an interesting contrast in colour and material. The 1876 Education Department building is a representative example of a Competition Derived School. 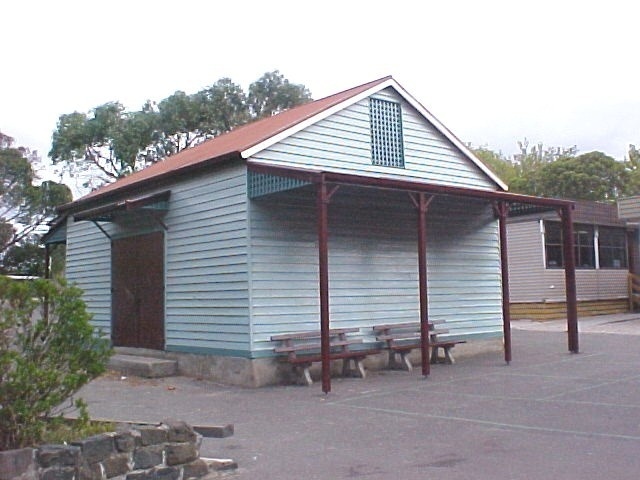 The complex of buildings on the site including the timber shelter shed demonstrate a changing sequence of styles and usage over time after the school's establishment in 1856. The aluminium classroom on the site is an intact example of a Bristol classroom and retains its original corrugated aluminium ceiling. Ballarat, Dana Street Primary School No.33, Dana Street, Ballarat, Ballarat City Council. 1. 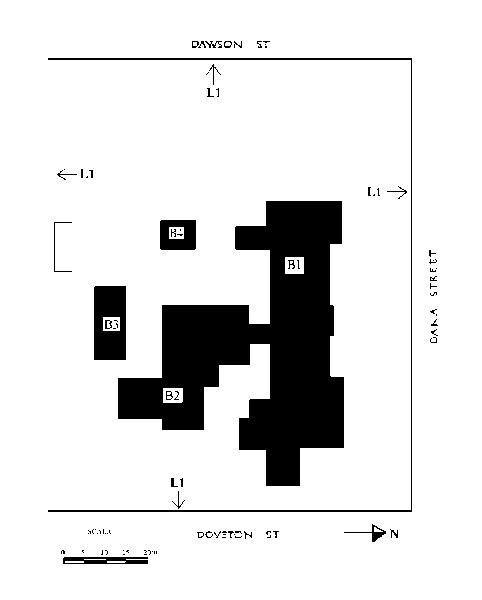 To the extent of the buildings marked B-1, B-2, B-3 and B-4 on diagram 603854 held by the Executive Director. 2. To the extent of the land marked L-1 on diagram 603854 held by the Executive Director, being part of the land described as Reserve 7222, Section 7, Crown Allotment 1-6 and 19, 20, Parish of Ballarat. 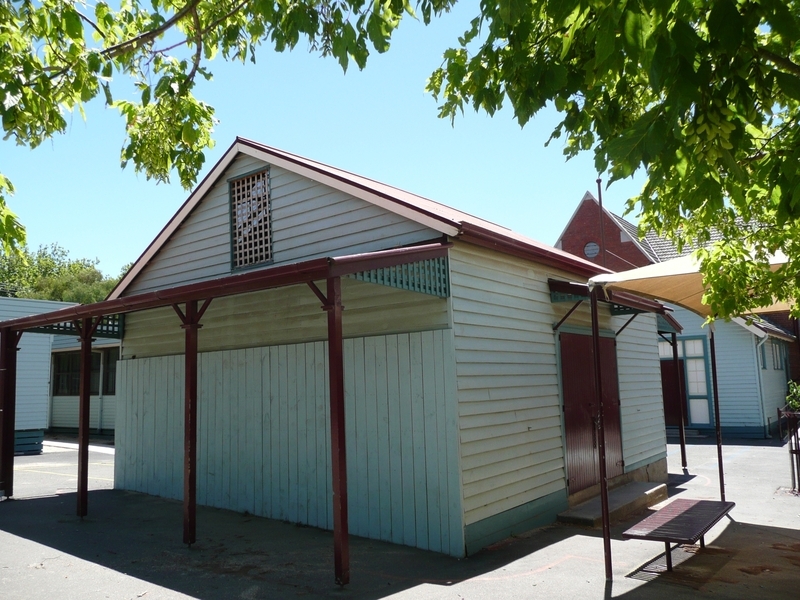 The Dana Street School was founded at a time when the population of Ballarat was settling down after the excitements and uncertainties of the early 1850s gold discoveries. The introduction of deep-sinking techniques of mining gave stability to the town. Miners began to build log huts in which to stay during the winter: large buildings were constructed for stores and businesses. A miners' hospital was set up in 1855, a medical association of sixteen medical practitioners formed and solicitors, auctioneers, builders and blackmiths were advertising in the new local newspaper, the Ballarat Times. After only three years, the population in September of 1854 was 25,000 people. Crown land was released for farming in the surrounding district, and the produce brought in to Ballarat for sale at market. Education was an early concern but the numbers of children of school age attending school were low (Weston Bate, 1978 pp39, 49). The National School was located at the junction of Doveton, Dana and Dawson Streets in Ballarat and the school playground was on the site of the Grand Junction Mining Company from which over £9000 worth of gold had been extracted at 292 feet. The school committee included Peter Lalor, M.L.A., the Eureka leader, and James Oddie, the first chairman of the municipality of Ballarat. An early inspector reported that although his examination of the children in 1857, 54 boys and 37 girls, showed defiencies, this did not reflect on the teacher because the school had had 102 new admissions since his last visit four months earlier, thus illustrating "the extremely fluctuating nature of the attendance" (James Grey to The Secretary, Board of National Education, 28 December 1857). In the first years of the settlement of New South Wales, it was assumed that the Anglican Church would be responsible for elementary education. But by the early 1830s it was clear that public opinion did not support an exclusive system. The system of education chosen for New South Wales in 1836 was based on the Irish National Board system. In Ireland the difficulty was to provide for religious instruction in schools for the Catholic majority as well as an influential Protestant minority. Schools administered under the Irish National Board received government aid on condition that children of all faiths were permitted to enrol. A secular education was supplemented by the daily reading of scripture without comment by teachers and separate weekly period of instruction by clergy of the major denominations. Such a system was very suitable for the colony since no one denomination had an absolute majority, and it was uneconomic to provide separate denominational schools in every little town (Burchell p.18). On 4 January 1848 Governor Fitzroy appointed a General Education Board for the regulation and inspection of schools to be established and conducted on the Irish National system. Subsequently a Denominational Board was appointed to supervise the church schools and on 11 February a Denominational Board for the Port Phillip District was appointed. On 15 June 1848 the Governor assented to the first Act relating to education in Australia, setting up the Board of National Education and permitting it to hold land and buildings. A National Board for the newly separated colony of Victoria was set up on 31 December 1851. Between 1848 and 1851 the Denominational Board had administered National Board funds for National Schools in the Port Phillip district. Agents for the National School Board travelled round the colony to organise public meetings of those possibly interested in the establishment of a school. At such meetings the agent would explain the regulations of the Board, help parents select local patrons for a school, gather information on possible sites and prospective enrolments and report to the Board on the best way to set up a particular school. Local residents paid one-third of the building costs for a school, erected usually on a Crown grant or on land vested in or leased to the Board. In settled districts, the site consisted of one to two acres; beyond the settled districts a site of ten acres was recommended. Though local parents could recommend teachers for employment, the Board retained central control over appointments. A teacher was paid a minimum wage of £40 a year, and could supplement this with fees of between a penny and one shilling a week. Before any government aid could be granted a minimum of 30 students was required (L.Blake, 1973 Vol. 1). The introduction of the National School system was intended to acknowledge the diversity of religious affiliations in Australia and to minimise sectarian animosities. Its legacy in Victorian has been the strong government school system which has fostered the education of children of diverse religious and cultural backgrounds. Benjamin Backhouse was born in Ipswich, Suffolk in 1828 and arrived in Melbourne in 1853. He built up an architectural practice in Geelong and Ballarat and entered partnership with his former draftsman William Reynolds in 1855. He lost his assets in a business reversal and had returned to England by 1860. He re-migrated to Brisbane and stayed eight years there building up a practice. In 1868 he won an architectural competition in New South Wales and moved to Sydney. He proposed the formation of the Institute of Architects in 1870 and became its first secretary. In 1884 he handed over his practice to his son Clarence . Backhouse professed socialist political views and decided to enter political life late in his career. He was appointed to the Legislative Council in 1895. He died at Rushcutters Bay on 29 July 1904. Dana Street Primary School, Ballarat no. 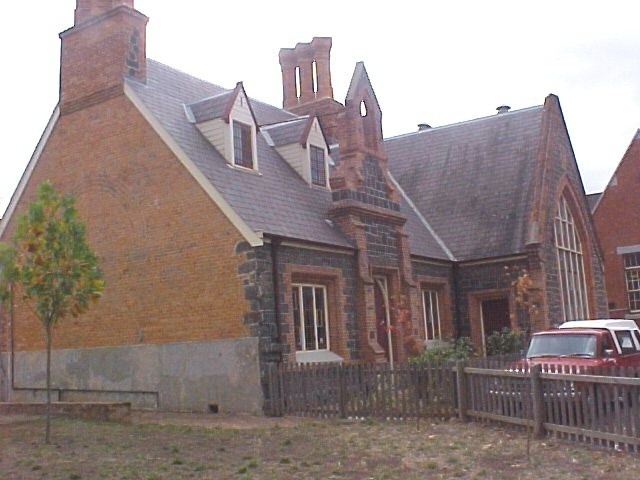 33 was constructed in 1856 as the first National School in Ballarat West to a design by the prominent Geelong architectural firm of Backhouse and Reynolds (James Oddie to B.F.Kane 11 January 1856). It was opened on 12 January 1857 and was conducted initially by Mr and Mrs Charles Martin. The exterior has been substantially altered since the initial construction. A second building was built in 1875-76 adjacent to the former National School to face Dana Street. 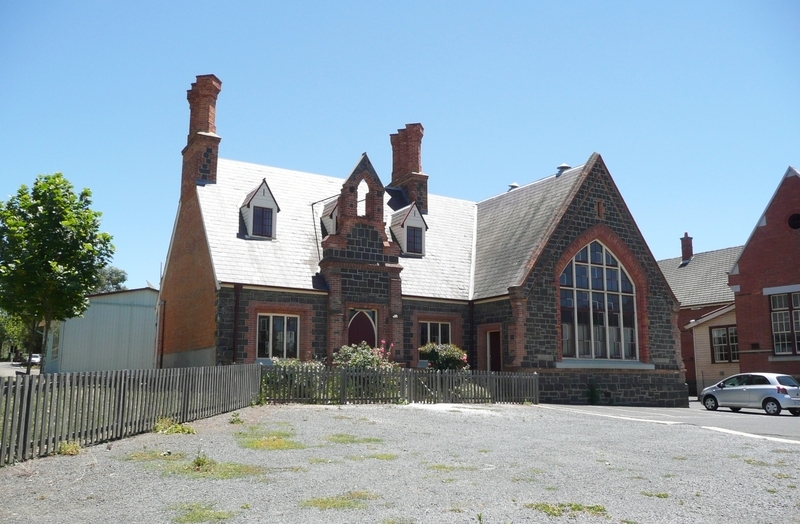 This was built to a design derived from the Buninyong School of 1873-74. The National School building has been substantially altered externally. In 1907 a large window decorated with hood moulding replaced the three narrow windows beneath the gable. The bellcote was removed in 1948 and a gablet constructed. 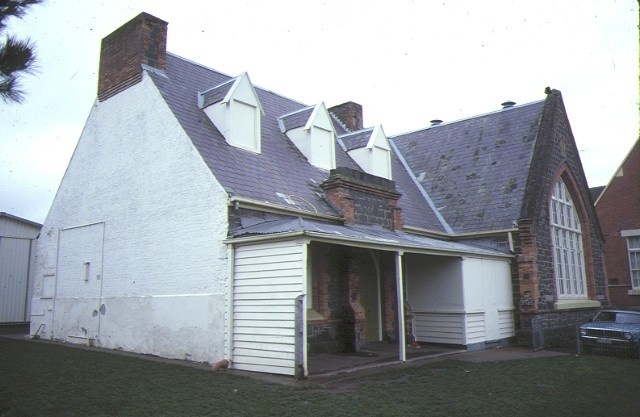 The portico was removed and a verandah added The large brick chimneys have also been removed. Dana Street Primary School, Ballarat no. 33 is important for reasons of educational and social associations in that it is a school which has operated as a local school for 140 years, beginning as a National School in 1856. 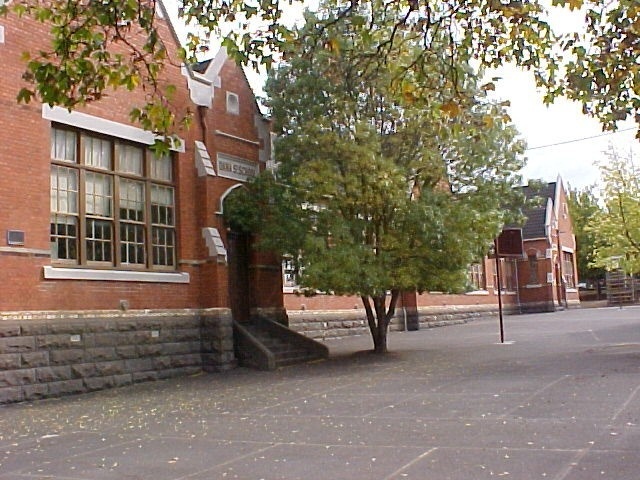 Dana Street Primary School, Ballarat no. 33 is a representative example of a National School. 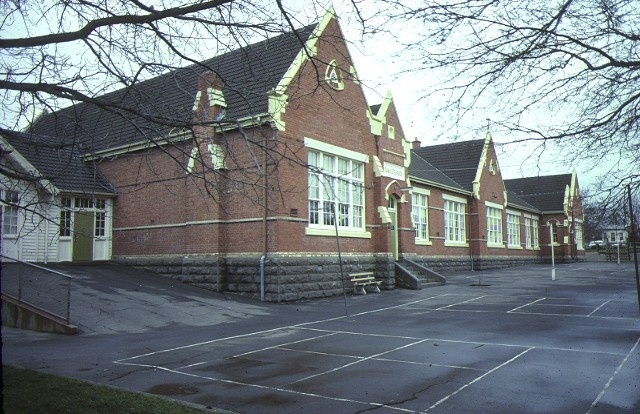 Dana Street Primary School, Ballarat no. 33 is a representative example of the work of Geelong architects Backhouse and Reynolds.